SAUTER actuators are energy-saving, and no waste is produced during fitting. 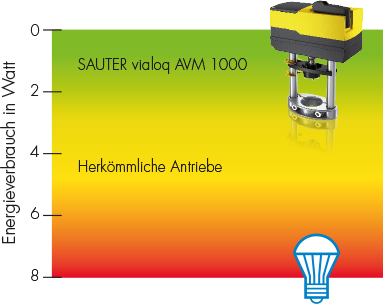 The SAUTER vialoq AVM consumes only half the energy of comparable control units. This is less than a conventional LED lamp. Despite the minimum energy consumption, the actuator provides the maximum performance. In stand-by mode it is particularly energy-saving. And this pays, because actuators spend around 80% of the time in stand-by mode and only 20% in motion. 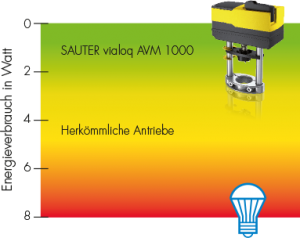 The impressive energy efficiency of the SAUTER vialoq AVM conserves the environment and resources sustainably and helps you to reduce operating costs. Fitting the SAUTER vialoq AVM retrofit actuator only takes a few minutes. Also, the installation does not produce any unnecessary waste, because at SAUTER you order precisely those accessories that you need for the relevant valve type. Therefore, by the commissioning phase you have installed all the elements supplied and do not have to dispose of any surplus components. See for yourself in our animated video.